Boateng: "The game's quicker here than in Italy"
Gelsenkirchen - Kevin-Prince Boateng has only been a Schalke player for two days, yet he has already won his first game, a feat the side had previously failed to achieve in the league this term. The 26-year-old had an immediate impact in the heart of the Royal Blues’ midfield, making a major contribution to a 2-0 win over Bayer 04 Leverkusen. After the game, the Ghana international reflected on his maiden outing and analysed the difference between playing in Italy and Germany. 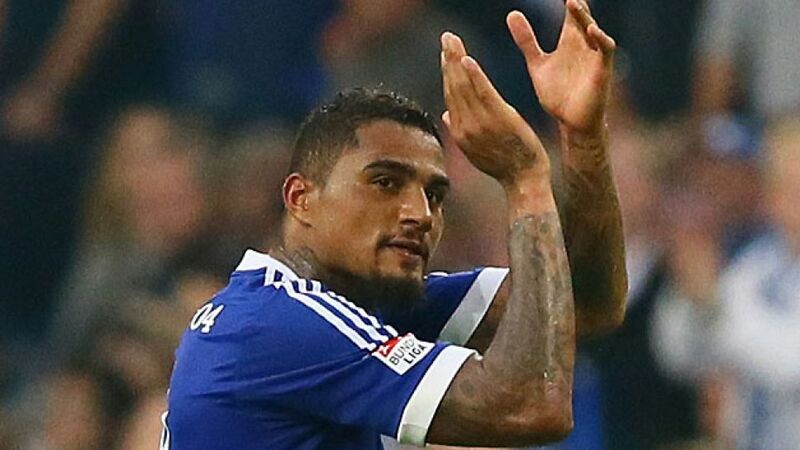 Question: Kevin-Prince Boateng, what a debut! Did you notice the fans applauding your every pass right from the very beginning? Kevin-Prince Boateng: Yes, I did notice it a bit. I’m very grateful that the fans have taken to me so well. I just tried to give it my best, but I also know that there's still room for improvement. I still have to get used to my new team-mates and the style of play. I’ve only trained once with the team and there’s certainly a lot more to do, but I think we did really well overall against Leverkusen. Question: How did you feel in general about your first game at Schalke? Boateng: Fantastic, I’m absolutely delighted. It was a great team performance and as it was my debut I think I did ok. I tried to get involved and help the team. We’re a young side and can still learn a lot, but we’ve also shown against Leverkusen that we’re a strong team and we deservedly won 2-0 in the end. Question: Was it easy for you to find your feet here in Schalke? Boateng: It’s never easy when you join a new club, especially not after you’ve only trained once, but the team made it easy for me. The lads have made me feel at home and I’ve integrated well. The coach has made me feel at ease too. It was also a bit of a surprise for me to be in the starting XI straight away, but that says it all about the faith the new coach and the club have in me. They see me as a leader and I just want to perform to my best and help the lads. Boateng: Yes, it worked very well straight away with Julian and also with Jefferson Farfan. We harmonise well in midfield, all three of us. I told both of them before the game that we should be able to switch positions and be flexible. What’s important is that all three of our positions are filled when we are on the back foot, and we did a great job. Question: In Italy, there’s rarely as much emotion in the stadium as there is here in Germany. What did you make of the atmosphere? Boateng: It was incredible. I said when I was presented here on Friday that I think the Schalke fans are crazy, but in a positive way. And they proved that against Leverkusen. It was a great atmosphere in the stands, just how I imagined it would be. Question: You seemed to be happy at AC Milan, so what tempted you to join Schalke? Boateng: I said that I would like to join Schalke and now I’m here. It was my decision, both in a sporting sense and in terms of my personal life. The game is different here to in Italy; it's far quicker, and my son lives here in Germany, so everything’s perfect. Question: Your former coach Jürgen Klopp was also surprised about your move. Have you replied to his text message? Boateng:(smiles) No, I’ve not replied yet. I got so many messages after my move was announced and I’ve not replied to anybody yet. Boateng: I’m not even thinking about the Champions League. We’ve still got a few other games ahead of us and we have to think from game to game. We mustn’t talk about any objectives. The only decent goal we can formulate is to get three points in every game. My aim is always to win the next game.